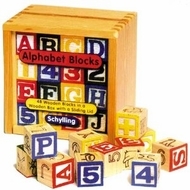 Amazon.com These painted wooden alphabet blocks are a true classic, the kind of toy that stays around from one grateful generation to the next. Each 1.25-inch cube is stamped with letters, numbers, and objects. Kids will spend hours at a time with these blocks, building, creating, and "writing." Regular playtime with them can heighten letter, number, and object identification skills, and illustrate how placing one letter next to another and another can make a word. On two sides of each block the letters or numbers are slightly raised and painted in cheerful red, blue, green, or yellow, with a border for emphasis. In addition to all the letters of the alphabet and numbers 0 through 9, there are four symbol blocks with a question mark and the plus, minus, and equal signs. The depicted objects include stylized stars, eyeglasses, flowers, trains, and bees. A nifty (and convenient) wooden box with a sliding lid keeps the 48 blocks in one place. --Emilie Coulter Product Description Tired of running out of letters when your trying to spell something?? Never run out of your favorite vowels or consonants again! This box contains blocks w/ both letters & animals! The paint is non-toxic and safe for all ages. To get this many beautiful blocks for this price is awesome!